This post is sponsored by haskapa, who I love for their delicious Haskap berry products. Their relish and chutney make it so easy to whip up a flavourful and unique dish that is sure to impress! Oooh la la! Look at that amazing colour. If you are looking for an appetizer that screams gorgeousness (but is secretly really easy to make), you have just found the recipe for you! This is very quick and easy to whip up. 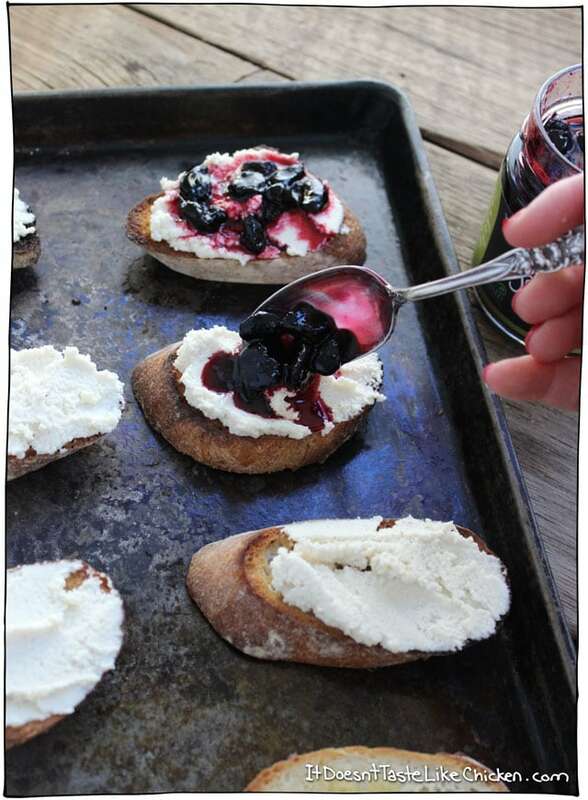 Use a food processor to blend up the macadamia ricotta, toast some baguette slices, smear them with the ricotta then spoon over the Haskap relish. Boom! 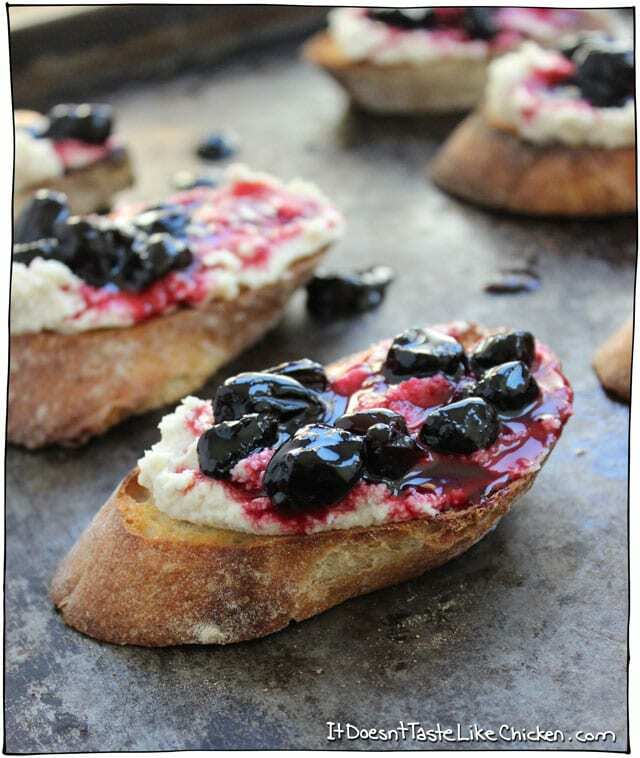 You can make the macadamia ricotta ahead of time, and assemble the crostinis when you are ready to serve. 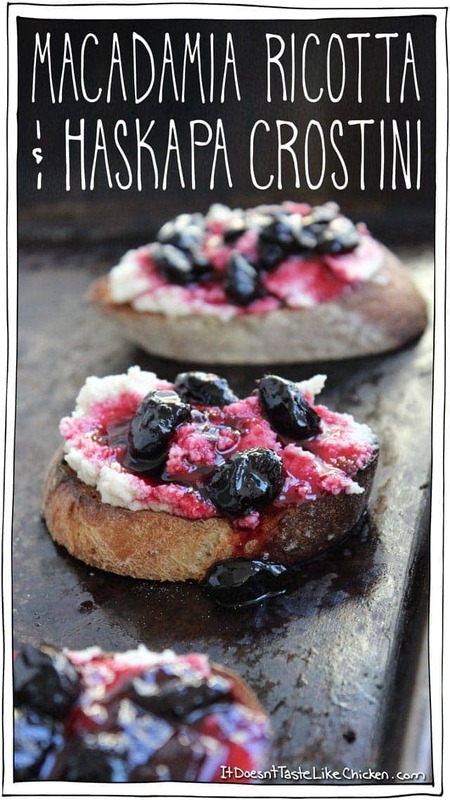 It’s not just a pretty face, this Macadamia Ricotta and haskapa Crostini is super tasty too. The macadamia ricotta is creamy, soft, and the Haskap relish adds the perfect compliment of taste and colour to make this app really pop. What in the world is a “Haskap” you ask? (Or at least I certainly did). Haskap is a kind berry that looks like blueberry that got stretched out. They are long instead of round, and they taste somewhere in-between a raspberry and blueberry, but are even more nutritious (um, superfood alert). While you aren’t likely to find them in your grocery store just yet, you can order them online here. You can buy the whole berries frozen or dried, or prepared in a number of different products. Juice, chutney, relish, chocolate, or syrup! 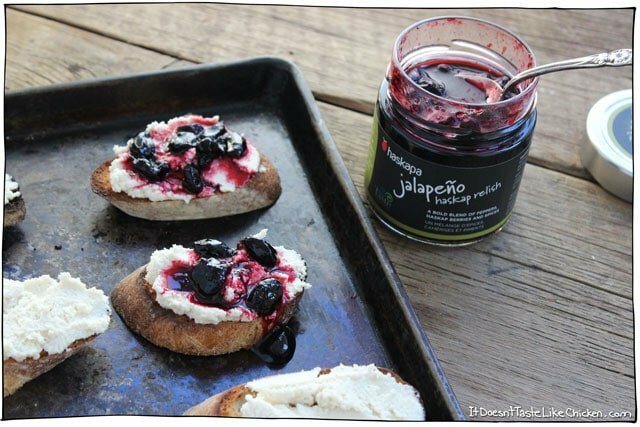 For this recipe I used this haskapa jalapeño Haskap relish which at first tastes sweet and rich, and then the flavour builds and you get a nice jalapeño zing at the end. It’s so yummy!!! If you aren’t a fan of the zing (spice), the chutney would pair with the macadamia ricotta beautifully as well. Now let’s get to appetizer making! …Until smooth and creamy. Yum! 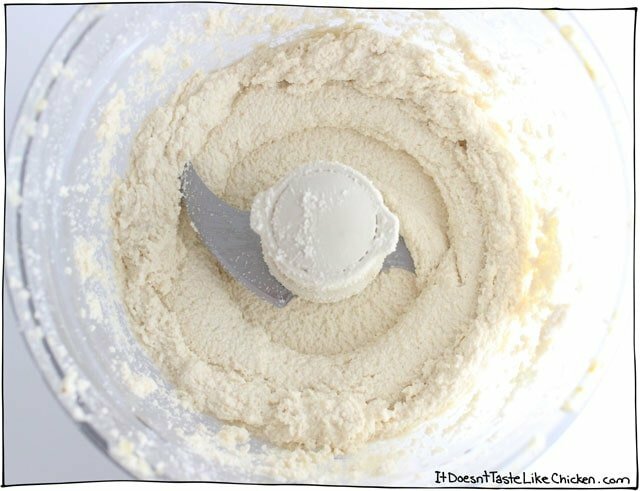 If for any reason you are not a fan of macadamia nuts, you could alternatively use my cashew ricotta recipe. They are both delish! 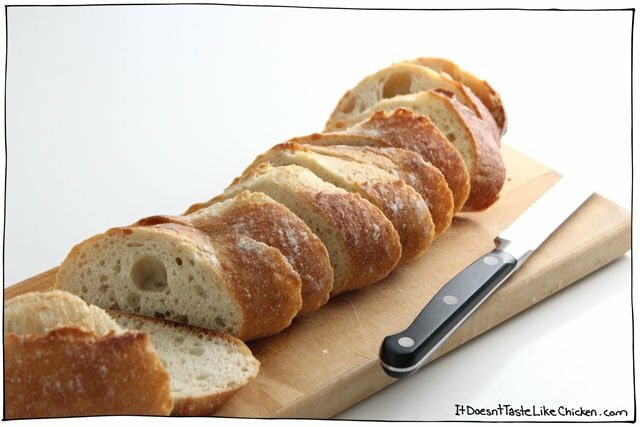 Slice your baguette. I like to slice mine diagonally because it looks all purdy and stuff. 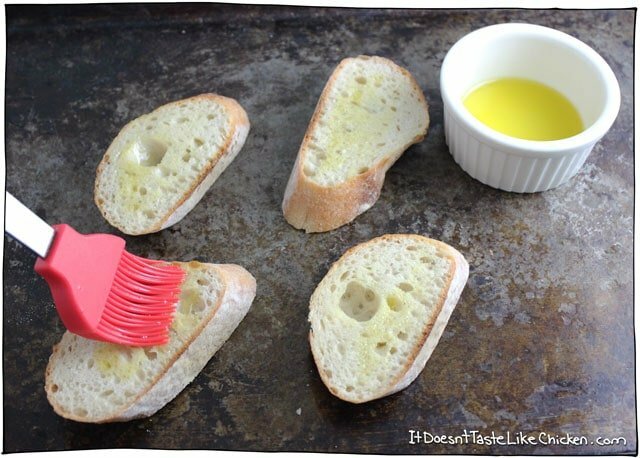 Lightly brush some olive oil on both sides of each slice. Pop them in the oven for 10 minutes, flipping half way through until they are nice and toasted. If you prefer oil free recipes, just skip the oil, and keep a close eye on them in the oven so they don’t burn. 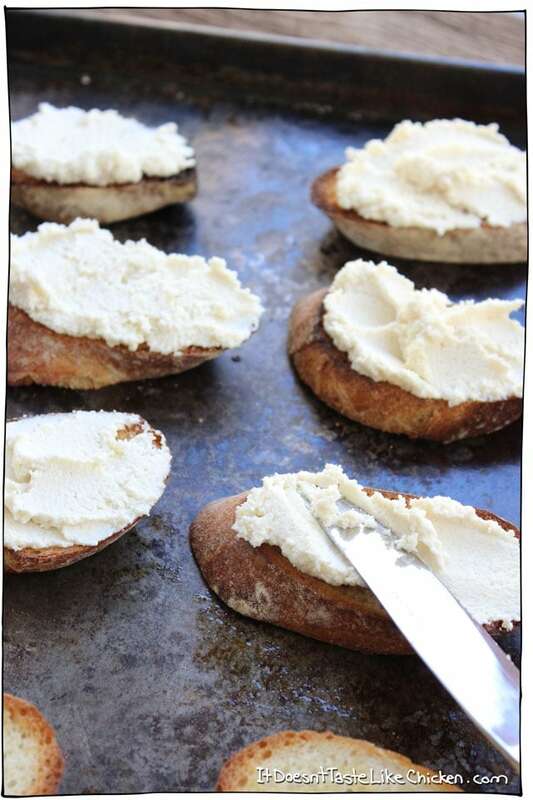 Now take your toasted baguette slices, and spread on some of that macadamia ricotta love. Then spoon on the haskapa Jalapeño Haskap Relish, and you have yourself one mighty fine looking (and tasting!) 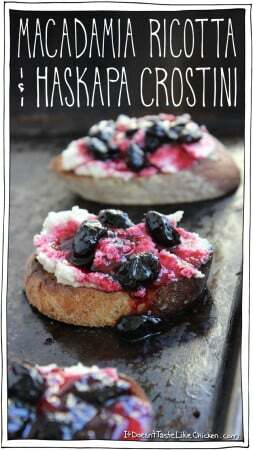 crostini. 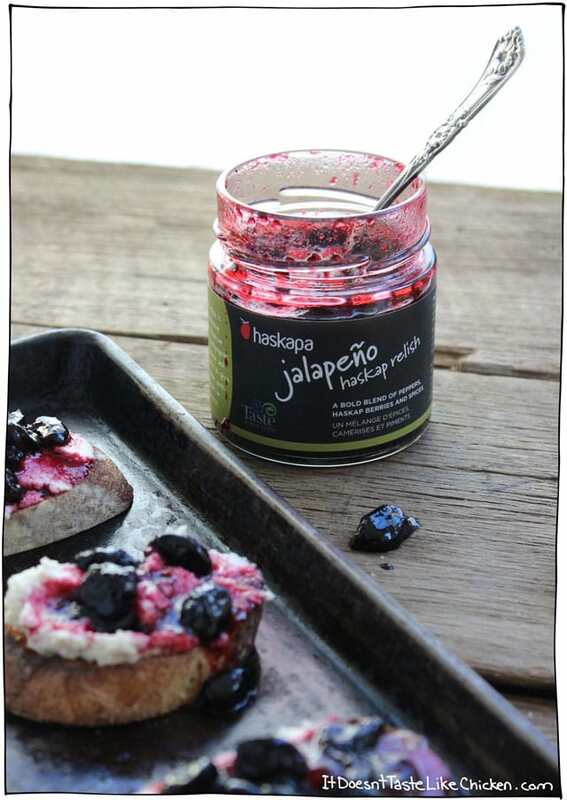 Click here for the nutrition facts for haskapa Jalapeño Haskap Relish. Previous Post: « 25 Vegan Christmas Cookies You Need to Bake Right Now! 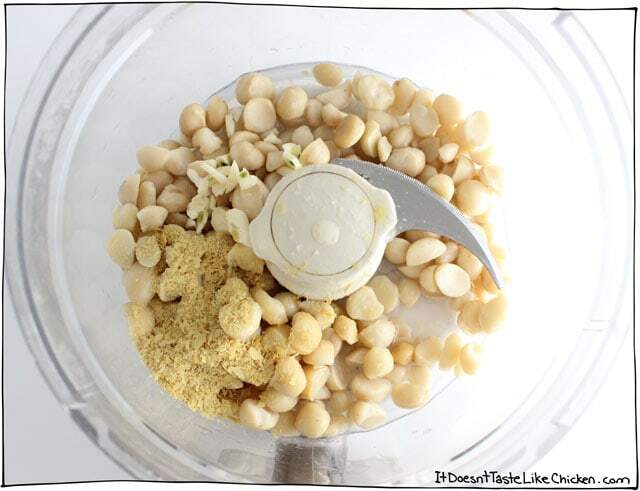 Isn’t it necessary to soak the macademias in water for several hours as with the cashew? Nope, they will blend nicely without soaking. Wow! What a delicious recipe! I never used macadamia before. Eagerly waiting to try this. Thanks Sam for such an awesome idea. I am from the US and we don’t have this product here. Do you have ANY suggestions as to how to replicate the relish? You can order it online here, they ship to the US. Or you could try a red pepper jelly. It will obviously look and taste different, but it will still have that sweet and spicy combo that goes so nicely with the macadamia ricotta. Hope that helps! This looks lovely. I just bought white miso paste so i could make this today! It looks good, haven't made it yet, but….. do you think it would be good if i added a little balsamic/ vinegar to the cheese mixture to make it more tangy? Like a goat cheese maybe? Balsamic is a lovely flavour, but it might start to tint your macadamia ricotta brown. The ricotta is already a little tangy with the miso paste and lemon juice, so I would recommend to taste the recipes first, then if you want to add more flavourings, go for it! uh, this looks AMAZING! Sweet, spicy, creamy, crunchy, savory – all that jazz! I do believe I’ll be taking this to our family Christmas gathering – thank you! You’re welcome Angie! I should hire you to write the descriptive words for my recipes! Haha!